If you’re an Android user then you are truly blessed with a myriad of apps that you can use for just about anything. The Android market place is teeming with around one million apps these days, and people can get overwhelmed by the staggering amount of tools. 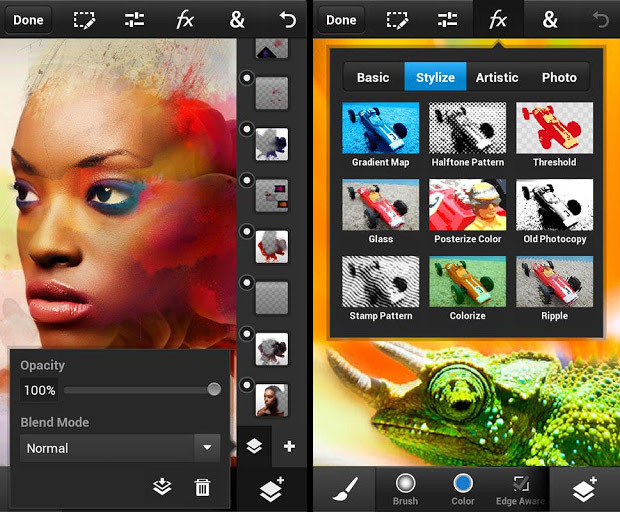 The Photo Editor by Aviary is a comprehensive photo editing app on which you can do just about anything you desire. Among the many editing features, we note the cosmetic tools, which remove blemishes and other skin impurities, the meme generator and the one-tap auto enhance option. With over 250,000 five-star ratings, we can safely say that it is among the most cherished Android photography apps. PicSay Pro has over 65,000 five-star ratings on the Android, and this makes it one of the most beloved and trusted photo editing tools for Android smartphones, with easy options for exporting photos on Flickr, Picasa or Facebook. It’s also a lot of fun to use because you can adorn your friends’ pretty faces with mustaches, insert text bubbles, or you can simply add different effects to photos. In many ways it’s similar to the photo editors that you are probably already used to because it also has contrast, saturation, tint, exposure and brightness options. Vignette is yet another excellent Android camera app. Most users download it for editing because it has more than 70 effects and 50 frame styles that you can choose from. In addition to this, each and every effect can be further personalized with the help of over 20 custom settings. Lastly, you can edit photos as you take them, an extremely convenient feature. Most professional photographers are already familiar with the desktop version of Adobe Photoshop—one of the most powerful photo manipulation programs—so they were more than eager to try out its companion app, now available for Android. The app basically brings all the important features of Photoshop to the Android OS, and even if it may seem a little difficult to understand at first, if you persevere, you will soon find out that its editing capabilities go far beyond that of Instagram or Aviary. If you are not really into professional photography, or you simply want to make your photos look better for Facebook, make sure to download Snapseed. First of all, it is completely free. Secondly, it’s equipped with many refined filters and tools that will help you highlight the most important features of your photo. When it comes to photography, the most important process is definitely the shooting. You can easily edit a photo that has good light and decent framing, and with the following smartphone photography apps the process will be very simple. Learn how to change the mood of the camera, the light intake and many other things, in order to capture the most beautiful pictures. At the moment, this is the most popular photo app and it also offers a cloud platform to manage files, plus eight shooting modes (including quick-shoot, self-portrait and audio mode). Camera360 is the best app for those who are still working their way around the Android OS because every shooting and editing option has little notes and descriptions. The app also has a “funny-photography” mode, with which you can create Andy Warhol-style or ghost pics. As the name clearly states, the Pro HDR Camera is one of the most advanced Android photography apps for shooting photos. With it you can take great photos, with good contrast, lighting and brightness. Another thing that you will definitely appreciate about it is the fact that it can take great-quality photos on dark nights (obviously, this also depends on your camera specifications). ProCapture has received nearly 3,000 five-star ratings, and for good reason: it’s a wonderful photo-shooting app that will definitely enhance your Android camera experience. At the moment it’s available in a free version, and a paid one (which has more features). With it you can create panoramic photos, and link together several photographs in order to make one, high-quality one. Are you in love with vintage and retro effects? Android’s answer to iPhone’s Hipstamatic was a vintage camera app called Retro Camera. This tool is basically a camera through which you can add different effects, like film scratching, vignetting etc. It also has a fast sharing option for social media profiles. Photaf is undoubtedly the best Android app for creating 360-degree panoramic photos. As a matter of fact, it is so advanced that you can capture panoramas horizontally, vertically, and even in HD quality. The only thing you need to do is to keep your hand still while taking the shots! Unless you have been living under a rock for the past few years, you probably know what Instagram is. The app was purchased by Facebook a while back, and at the moment, it is the most popular social platform for sharing photos online. As a matter of fact, Instagram could easily be featured in the editing category as well, but we decided that its most notable impact has been as a sharing medium. So, if you want people to see, like, and share your photographs, you should definitely become a member of the huge Instagram community. Postagram is indeed a photo-sharing app, but it may not be the type of sharing that you had in mind. With it, you can turn photographs into high-resolution postcards, printed on glossy paper, and send them anywhere in the world for little over a dollar. If you are traveling around the world, you can easily stay in touch with your loved ones at home. Snapchat has a funny way of sharing your photographs with the rest of the world. The whole idea is to quickly take a funny video or photo and then send it over to your friends. As soon as they see it, it will disappear. Dropbox is undoubtedly the best tool for sharing images—with yourself. Forget about the days when you had to connect your smartphone to your computer through USB. With Dropbox, all you have to do is connect to the internet on both devices and it will automatically share your photos, documents and videos. If you want to access your files, you can simply share a link with friends and family. Flickr is one of the most popular platforms for people who like to share their photos. It lets its users take pictures with the app’s camera, and instantly share it on Facebook, Twitter, Tumblr and Flickr groups. 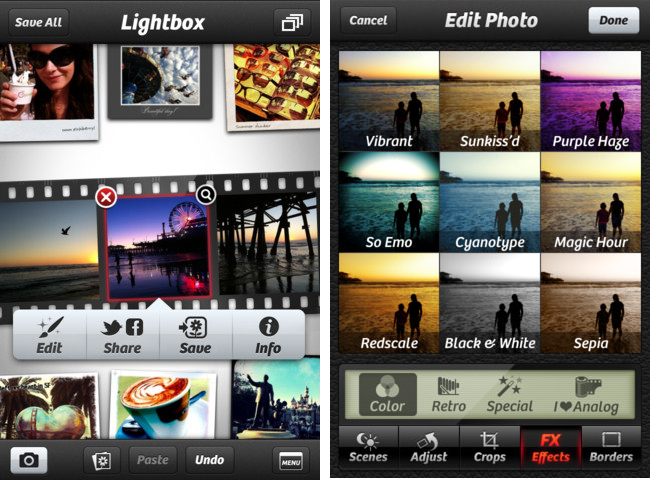 Like Instagram, it also has a few editing features, and it is hands-down the best way to share high-resolution photos. PerfectShot is a pocket photographer’s dream because it has a wide variety of features like smart auto-focus, fast launching, multiple modes, zooming, and an innovative control system. It basically has all the features that you were used to on your D-SLR. It’s also equipped with some great filters (white balance, exposure, flash-modes, zoom), which will make image shooting more effective. There is a saying among photographers that the best hours to take pictures are the first one and the last one of the day. They also refer to it as the “golden hour”, but sometimes it’s hard to tell exactly when that hour is. With the Golden Hour app, you can easily calculate the best time for taking high-quality photos, according to your current location, date and season. As if this wasn’t enough, the app also has a weather forecast feature. As a professional photographer you will be taking lots of photos, and you need a place where you can organize them all. The Fish Bowl photo gallery will copy all your selected images and arrange them for better viewing. A great app, based on a simple, yet effective idea. The tools does exactly what it says: it adds watermarks to your photos. This will keep people from stealing and re-posting your photography. You can even create your very own, personalized logo. Do you want to become a professional photographer, but you have no idea where to start? Courses are probably expensive, so why not take advantage of this nifty little app. It offers a step-by-step guide that will help you with your D-SLR, scene settings, aperture, shutter speed, ISO and many other. The great thing about it is that you can check out other photos, and see what settings they used. So these are the top 20 Android photography apps for shooting, editing and sharing. Which one are you using at the moment? Please share your thoughts.